Yang May-Fang is very filial, she knows that her mom was suffering from long term hip and knee joint pain, and numbness, especially whenever her mom climbed the stairs in the past she had to pound her own hips in order to ease the pain. Actually I did the same too when I had slipped disc pain, I was hitting my leg to divert the pain. After wearing Nefful negative ion clothing, her mom no longer needs to pound her hip as her condition had improved as she no longer feel the pain when she climbs the stairs. 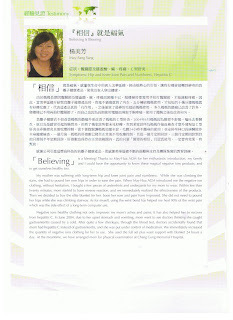 Click on the attached document to read the detail sharing of Yang May-fang and see how her own health problem improved too. If you know any friend's mom who is suffering from the same pain as May-fang's mother, do share this with your friend, let them have another effective choice to ease the pain.